We provide pedestrian road safety training for primary school children in Brighton & Hove. The training is practical and provided during school time in year 1 (age 5 to 6 years) and year 3 (age 7 to 8 years). All schools taking part will receive help and advice in setting up the scheme from the Child Road Safety Training Co-ordinator. Child Pedestrian Training is one of the initiatives that can help reduce the number of child casualties on the roads. The number of child pedestrian fatalities in the United kingdom is high compared to other European countries. Children aged between 11 and 15 remain the most at risk. We give priority to schools with a current School Travel Plan that identifies walking to school as a key objective. Our training consists of practical roadside training and classroom activities, taught in schools during school time. The booklet 'Road Safety Training, A handbook for schools'[DOC 376KB] provides further information. Children work with fully trained Child Pedestrian Trainers in small groups. Children receive a consent form [PDF 390KB] so that they can obtain consent from their parent/guardian before they can take part in the training. View details of the training for children aged 5 - 6 years in 'Road Safety Training for your child, An essential guide for parents with children aged 5 - 6 Years' [PDF 1.48MB]. View details of the training for children aged 7 - 8 years in 'Road Safety Training for your child, An essential guide for parents with children aged 7 - 8 years' [PDF 1.18MB]. 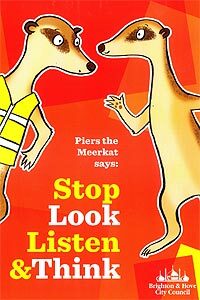 Download the following Piers the meerkat resources for use with your children. For further information about the scheme please contact transport.projects@brighton-hove.gov.uk ,Emily Tester on 01273 293847 or Terry Nye on 01273 293845.